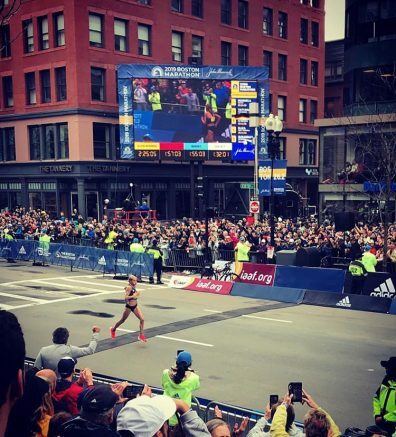 15th May 2019 – Twenty-four hours before the start of the 2018 Boston Marathon Jordan Hasay (USA) was forced to withdraw with a stress fracture in her foot. Fast forward one year and she was back running down Boylston Street to cross the finish line in third position and as the leading American athlete. This was Jordan’s third podium finish in her three major marathon starts, but arguably the most significant as it signalled the end of a difficult twelve-month period and showed she is ready to compete at the top end of the sport again. Jordan and her team were delighted with the result and how she executed the race. She resisted the temptation to go with the early surges, sticking with her own plan that saw her pass halfway in 73:08. As others began to fall away Jordan’s strength shone on the infamous hills of the Boston course and she ran a negative split of 72:12 to clock a final time of 2:25:20. On the roads in the UK there was another victory for Steph Twell (GBR) as she dominated the Brighton 10k. Leading from start to finish she broke both her PB and the course record with a time of 31:58. The track season continues to gather momentum and at the Grenada Invitational Bralon Taplin (GRN) delighted the home crowd by taking victory in the 400m in a time of 44.92 seconds.